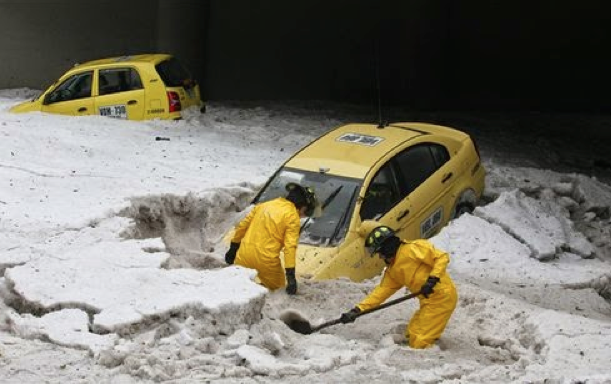 All around the globe, extreme, destructive, and unprecedented “frozen precipitation” events are occurring. A great many of these events begin at temperature ranges far above the freezing point (though temperatures on the ground can drop precipitously as the nucleation process unfolds). Why? Most have never heard of “chemical ice nucleation for weather modification”, butpatents exist for this process and the Chinese government has long since admitted to engineering frozen precipitation events. The 90 second video below is astounding, a 200 foot wide river of ice flowing through the Saudi desert on November 2nd, 2015. 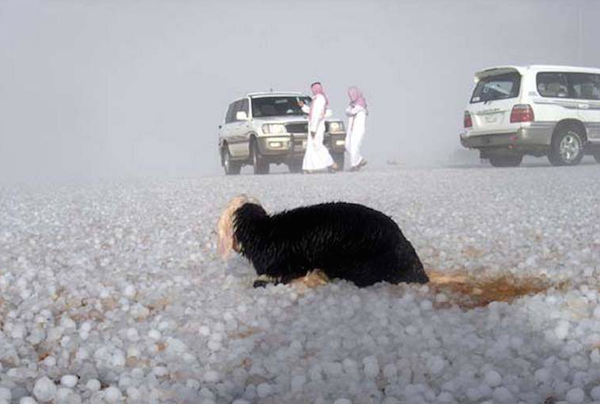 Extreme hail events are happening with alarming frequency, often in the most unlikely locations where such storms have not historically occurred. When moisture laden storms are saturated with artificial/chemical ice nucleating elements (due to the destructive attempt by the climate engineers to temporarily cool-down ground temperatures on the ground), storms that would have been a deluge of rain become unprecedented onslaughts of frozen precipitation. The damage being inflicted by the rapidly increasing hail storms is massive and growing. 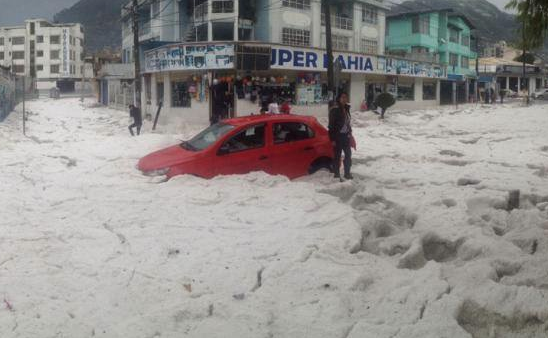 Africa is also being subjected to unprecedented hail events. 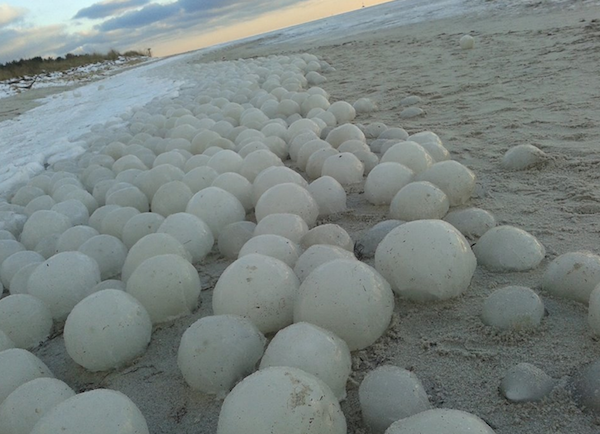 Below is a shocking photo of “ice balls” piled up on the shores of Lake Michigan. Why is there no long term historical record of such a profound phenomenon? Chemical ice nucleating materials form a central core of ice that builds up around itself. The motion of the waves then contribute to the spherical shape. 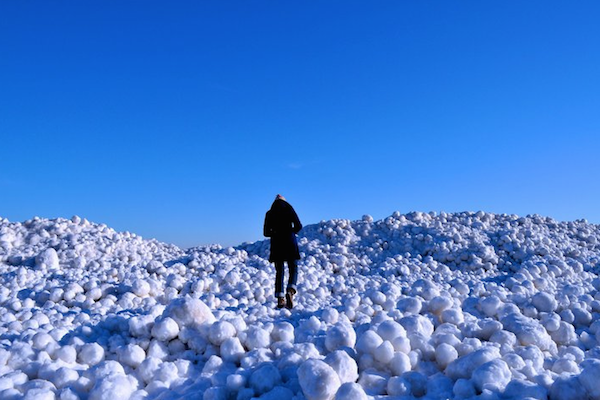 “Ice balls” have formed and accumulated on Lake Michigan in the last few years, why? Such “ice balls” have even formed on lake water that was 40 degrees, how is this possible at temperatures far above the normal freezing point? Without chemical ice nucleation, it isn’t possible. What is occurring on the shores of distant seas? Yet more “ice balls” have appeared in recent years. 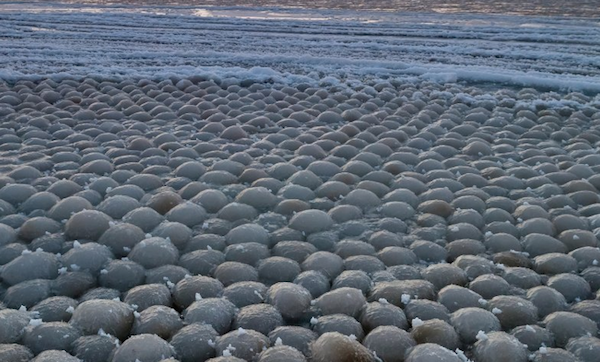 “Ice balls” on the Baltic Coast in Northern Poland. “Official” sources say this recent unprecedented phenomenon is just “natural”, are we to believe them? Other European countries are noting the same phenomenon. Ice balls on the coast of Finland. The “official” explanation for this recent mysterious anomaly? Again, we are told it is a “natural” occurrence. How natural do these “ice pancakes” look in the photo below? 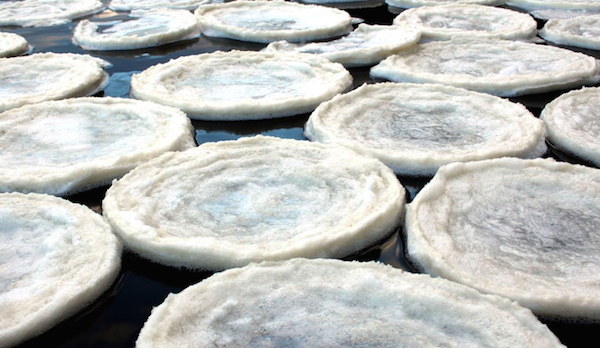 CNN news called these “ice pancakes” “mysterious”. This phenomenon has also been observed on various lakes and rivers in recent years. Chemical nucleation materials are the core causal factor that produce the recent rash of profound ice formations. 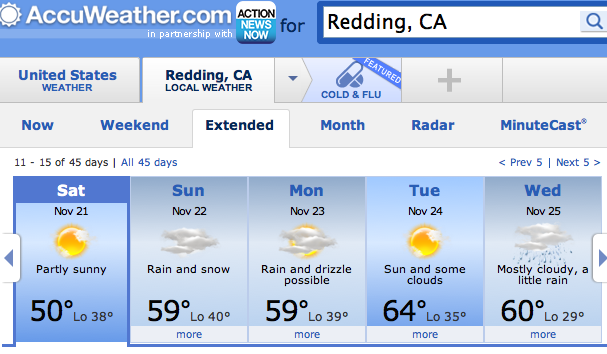 “Freezing rain” has now become commonplace. 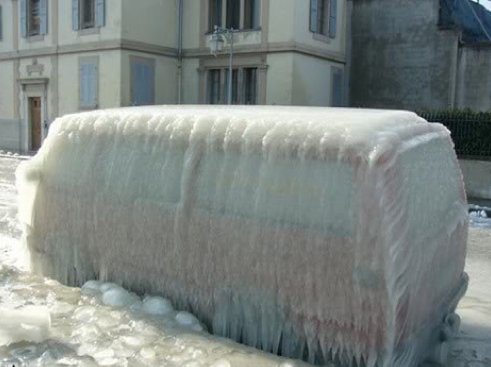 Extreme “ice storms” are wreaking havoc all over the globe. Depending on atmospheric conditions and temperatures, precipitation from storms that have been sprayed with chemical ice nucleating materials can reach the ground before actually freezing. This vehicle photo was taken in Versoix, Switzerland. Formerly unprecedented ice storms have now become the norm as the geoengineers do their best to create temporary chemical cool-downs in a rapidly warming world. Where can the most profound chemical ice nucleation examples be seen? 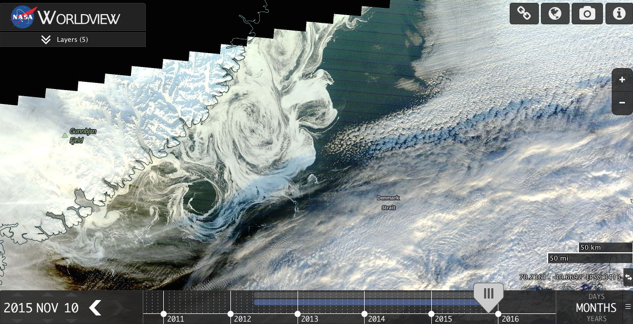 The satellite photos below show completely unnatural ice formation structures on the Arctic ocean, September 15th, 2015. Arctic ocean temperatures have persisted at record high levels and the warming continues to worsen. Why would ice form in open water under such conditions, and in a manner that is completely different than the normal ice pack winter expansion? 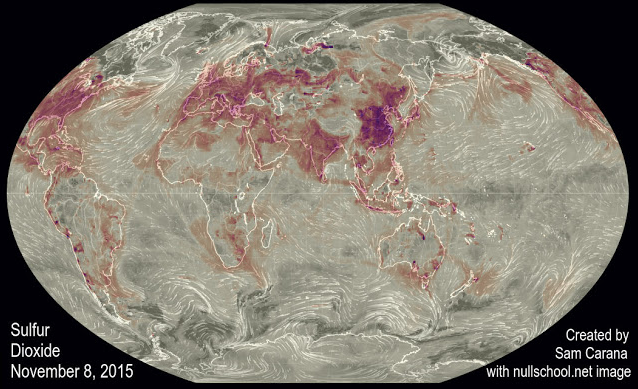 And all this during a year that has had record warmth and record ice melt in the Arctic? Surface ice formation on record warm seas worsens the overall warming by trapping the heat below. 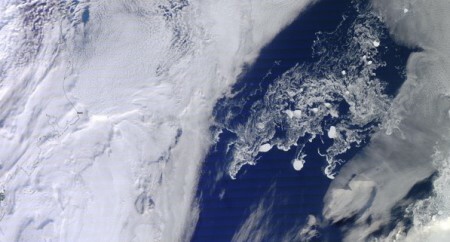 Another satellite photo taken over the Arctic Ocean, September 15, 2015. 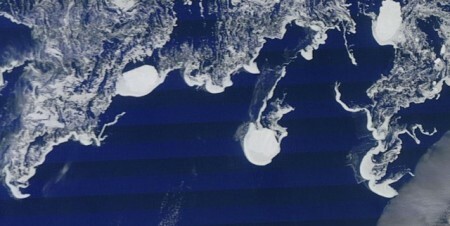 Extremely anomalous sea surface ice formation is clearly evident. 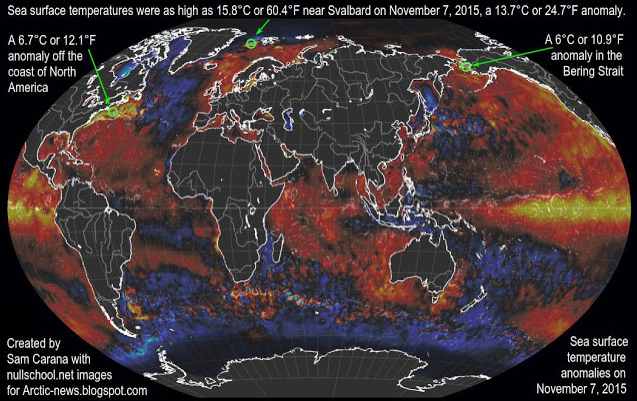 Even into November, 2015, astoundingly high ocean temperatures have persisted and continue to shatter records. The map below clearly shows that sea surface temperatures were as much as 24.7 degrees ABOVE NORMAL in the Arctic ocean on November 7, 2015. Global ocean temperatures are skyrocketing so rapidly that scientists must keep updating charts to keep up. The excerpt below was taken from a recently posted Article from “Arctic News”, it should be read carefully. Arctic news describes the effects of atmospheric particulates (primarily from geoengineering which Arctic news refuses to admit to). They then state clearly the negative overall effects of these particulates (again, a result of geoengineering). And at the end of the article from which this excerpt was taken, Arctic News and the Arctic Methane Emergency Group calls for global geoengineering to be deployed immediately, as if it has not already been going on for over 6 decades in clear view and causing catastrophic effects. We must all diligently “sift the baby from the bathwater” so to speak. Though the front line data from Arctic news is accurate and verifiable from other sources, their constant call for geoegineering to commence is extremely alarming. This sulfate has a cooling effect on areas of the sea surface whereocean currents are moving warm water toward the Arctic Ocean. Because the sea surface gets colder, there is less evaporation, and thus less heat transfer from the ocean to the atmosphere during the time it takes for the water to reach the Arctic Ocean. As a result, water below the sea surface remains warmer as it moves toward the Arctic Ocean. So the overall conclusion from Arctic News is that the atmospheric particulates are making a bad situation worse, not better. Yet, they continue to call for geoengineering deployment as if that is not the source of “atmospheric pollution” they have just condemned. Below is a recent satellite photo of the sea surface off the coast of Greenland. Again we see an extremely anomalous and unprecedented pattern of ice formations like those shown earlier in this article. 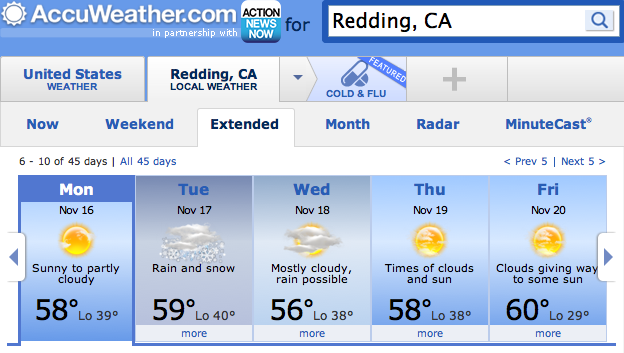 The AccuWeather “forecast” (scheduled weather) for November 16-20, 2015, shows snow with a daytime high of 59 degrees and a night time low of 40 degrees. Why? In the next map, we see snow again called for on the 22nd with the same temperatures as the earlier forecast, yet, on the 25th only rain is called for with much colder low temperatures? Snow is now often reported at temperatures up to 50 degrees and even above, welcome to the world of chemical ice nucleation. 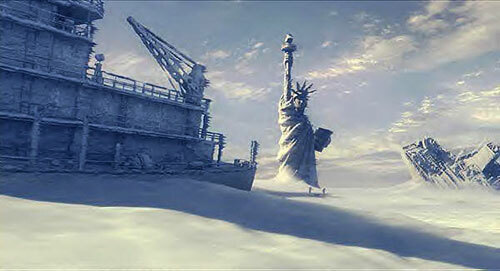 As previously mentioned, there are patents for such processes, and again, theChinese scientists have openly admitted their programs to create engineered snow storms. What scenario are the geoengineers creating in the US with their chemical ice nucleated cool-downs? 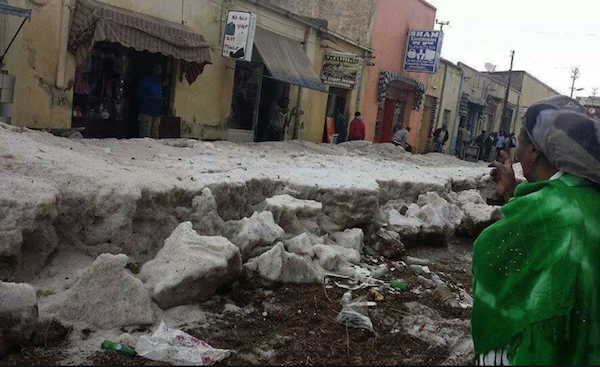 The exact antithesis of what has been the case in the US for the previous 3 winters. The extreme scenario shown in the most current NOAA map below is historically unprecedented, but in recent years has become the norm. The “scheduled” weather from the geoengineers is for temperatures to be up to 20 degrees below normal in the West, and 20 or more degrees above normal in the East. Chemical ice nucleation of storms and precipitation does create a cold dense layer of air on the ground level that can drastically lower temperatures temporarily. But what is the overall cost? 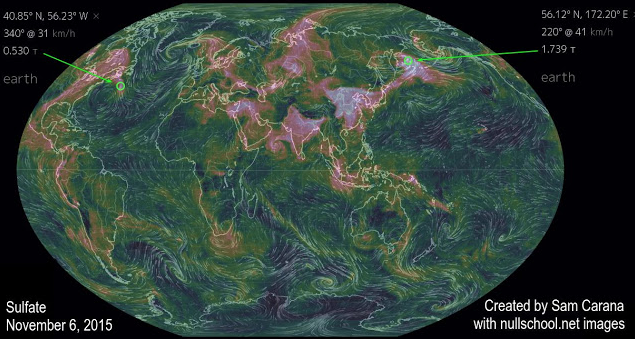 A decimated climate system, a worsened overall warming of the planet, and total contamination of the atmosphere and surface of our planet (due to the highly toxic fallout from the climate engineering programs). 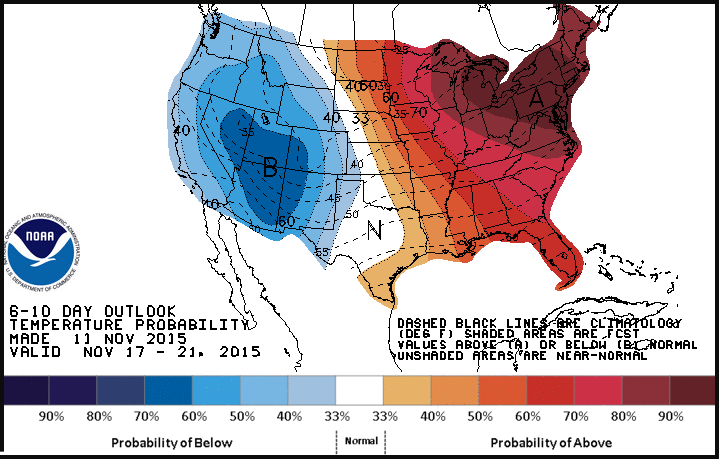 If you think your winter weather is natural, think again. Exposing the ongoing climate engineering insanity is challenge we must all face head on, make your voice heard in this battle. Forward solid information to all those that need to know and don’t. Make every day count in this most critical fight.